I really love one of the animated movies which titled “Lion King”. Yesterday evening once again I watched its movie. In this movie we can see a lion named “Simba” fought against Hyena group. Until finally Simba proudly stand up to be a king! In the real world, lion dubbed as king of the jungle. Why? Here are the reasons; Lion has incredible ability to fight, powerful, predatory, brave, and even a lion be able to climb a tree. This makes lion tougher than tiger. Lion has a very famous style which is when the lion pounced on their enemy’s nape. It is believed could knock down and kills the enemies in a very short time. There is so many another reasons why lion called as king of the jungle. But there is another thing from a lion that couldn’t be ruled out and this noted in the bible. Lion is a strong animal even strongest than other animals because lion never give up easily from anything. 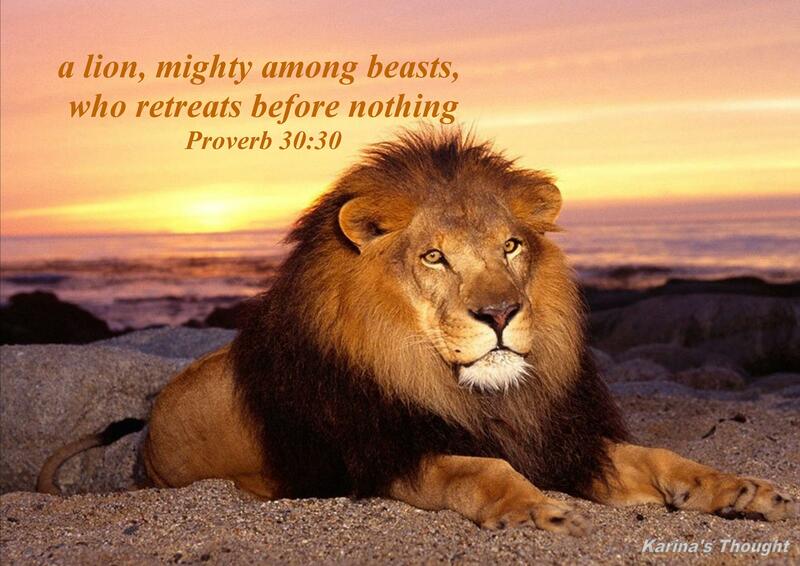 Lion is an unyielding animal. However, the bible pay attention even not on the lion’s fighting ability but rather to the mental ability to face many challenges. So now, what is the relation between us as Christians with the lion? Ok here’s a bit explanation about it. Lion could be a good example or illustration for us how supposed we behave as God’s children when we face so many life’s challenges. We should being like lion. Strong, never easy to give up, had a mental hardiness, and not easily discouraged. But in fact, many of us as Christians do not have it all. We are oftentimes become very weak and vulnerable buffeted by storm of life, easy to waver when hit by many problems. Even not a little of us had give up before truly facing the challenges. Actually, as Christians we have been equipped by God with various abilities and talents and we can use it to overcome many problems. Not only that, we are have been equipped with God’s Spirit who dwells within us. These verses firmly stated that we are the son and no longer become a slave, and God’s Spirit lived in us. Verily, with all that we have we are not supposed to be a vulnerable and weak person. We should to be a tough person. God created us as winner, even more than a winner. Not a loser! David was not afraid at all because he really knows where is God will stand. David knows God will standing in the row where he is. And the fact, successfully, David beat Goliath who wear armor and complete weapon. Unbelievable! Goliath defeated only with a traditional weapon. Stone and a slingshot! This is David’s attitude who illustrates a lion’s attitude which not easily to give up when facing many challenges, whatever it is. In the book of Revelation Jesus was said to be the lion of Judah who come from the line of David. Jesus as the Lion of Judah has proven His true strength as the King of king and never steps back from His tasks in this world as the Lord commanded to Him. And finally His tasks completed on the Cross. Just for our save sake! My dear reader, once again God created us to be like a lion, to be like genuine the Lion of Judah. We were created not to be a loser but conqueror, even more than a conqueror! We were created as His eldest Child. We have equipped with various skill and abilities to be performed with a figure like a lion. And not only that, because God be with us who always ready carry us to the each level of success, no matter how difficult the situation that we face today. I am not saying that as Christians we will definitely free from problems and obstacles. There are always obstacles and challenges in our lives. But with God, with a resounding, we will be able to overcome any problems and obstacles. As the verse above said, if God is for us, who can be against us? My dear friends, Do not ever give up, keep endure and struggling, to be a winner not a loser. Be strong as strong as lion. Have a winning mentality like a lion. Are we ready? Amen. strong as a lion. Karina – Living by Faith. Hello dear reader! Now I am back. It is such a great blessing that I could come back to the blog after I have been absent for around 2 months. I have missed so many great and wonderful posts of you and I will try to visit the blog who followed me and read any posts of you. Here’s my first post this year. Hopefully this post will bring so many blessings to you. Once again, my mind drifted away. Trying to look back and remember how much of a great blessing from God. And ultimately, I agree with my husband’s comment. 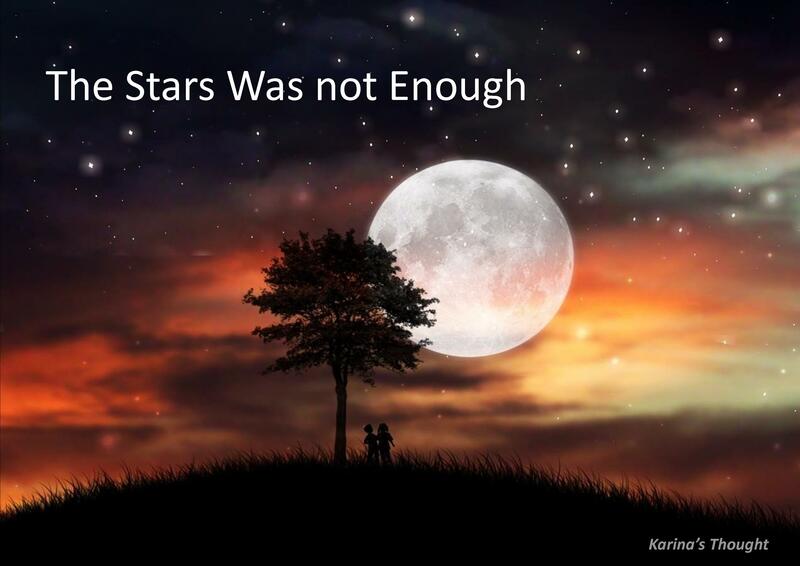 Yes, the number of stars are not comparable with how great God’s goodness and blessing. I am very grateful and feel how lucky I am as His child. God blessed me abundantly even when I got so many problems and difficult situation I still felt God’s blessing poured to me. Through many problems and trials God strengthen me amazingly and for me this is a great blessing. But just me? No! I am truly believed everyone had received and felt the blessing of God in many ways. But unfortunately, not many people realize and remember God’s goodness and blessing. Even worse, many people who experience distress and suffering could easily accuse God is not fair and partiality. Well, that’s not true! God is not like that. Each of us is blessed and got the same portion. God loves all His children. But the problem is many people often judge God’s blessing only in few aspects: longevity, wealth, position and honor. Outside of it is not regarded as a blessing. Whereas, if we want to contemplate for a moment, there are so many God’s blessing present in our lives. Even right now there are many blessing poured out as a form of His mercy to us. If we are still able to breathe, to have a complete eye to see everything, if our minds are still functioning normally, we can walk, work and can do many other things, it all is a blessing from God. This means that God still blesses us in many ways all the time. 14. The LORD upholds all those who fall and lifts up all who are bowed down. 15 The eyes of all look to you, and you give them their food at the proper time. 16 You open your hand and satisfy the desires of every living thing. 17 The LORD is righteous in all his ways and loving toward all he has made. 18 The LORD is near to all who call on him, to all who call on him in truth. 19 He fulfills the desires of those who fear him; he hears their cry and saves them. This verses clearly shows that David really understand how the God’s goodness and mercy always be with throughout his life. Although he had a very difficult time, full of suffering and struggle, he can still looking back to see how God’s presence in his life. God not only bless the good and the righteous people but even He still pays attention to the evil and the unrighteous as well. God still maintains and miss them to repent. If God alone still pay attention to the evil and the righteous how could God do not pay attention to us as His children? Do we still doubt His love and faithfulness? Are we still judging God is not fair?